Luis Manuel Otero Alcántara being arrested in Cuba on Tuesday, April 16. As the Thirteenth Havana Biennial kicks off in Cuba, a number of cultural figures who are known supporters of the artist-led movement against Decree 349the infamous new legislation that criminalizes independent artistic activity in the nationhave been targeted by the government. Cuban artist Luis Manuel Otero Alcántaraan organizer of the #00Bienal de La Habana, the alternative Havana biennial held last year after the official state-backed event was postponedhas been arrested three times. He was first taken into custody on April 4 but was released after the authorities warned him not to disrupt the exhibition or participate in any collateral events. Alcántara was arrested again last week for carrying out a performance with two collaboratorsthe work was a tribute to an action carried out by Cuban national Daniel Llorente at the 2017 May Day parade in Havana’s Plaza of the Revolution. Alcántara was detained for four days but was not formally charged. He was picked up by the police again yesterday, one day after his release. Artist Amaury Pacheco was also detained by state security forces yesterday and let go several hours later. According to artist, curator, and writer Coco Fusco, the arrests are part of a government campaign to “divide and conquer.” Authorities are labeling the creatives as dissidents and activists rather than artists. The strategy removes the arts from the equation, making the issue about politics rather than censorship. On April 12, artist Michel Matos was also harassed by the police. On Facebook, he wrote that he was informed by a member of the interior ministry that he had to report to the police station due to “irregularities” with the ownership of his house. After arriving at the station, he was subjected to a nine-hour interrogation. 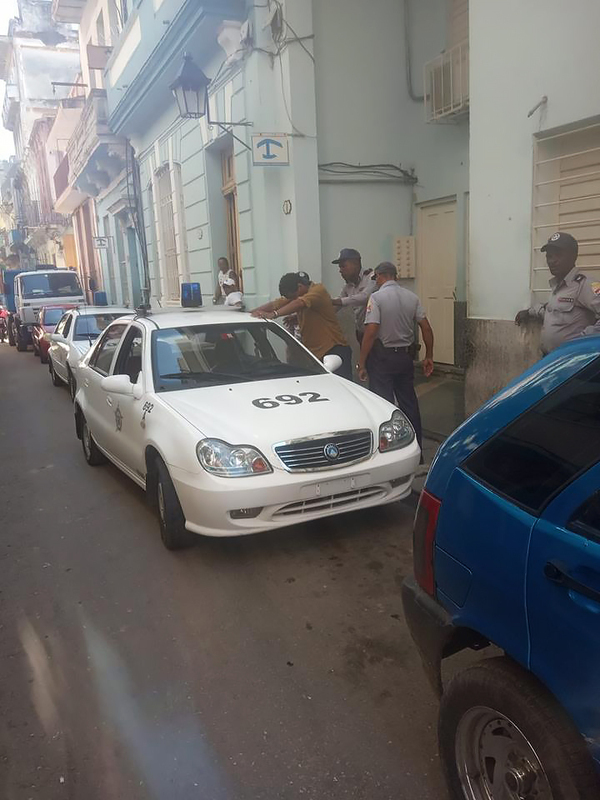 Police officers questioned him about his involvement in Alcántara’s performance, his family, and contemporary art in Cuba. Matos said that one official repeatedly referenced Tania Bruguera and her “desire to destroy the revolution.” He was also warned of the dangers of the San Isidro Group, which organizes protests against Decree 349.